The weakness in spot price silver was evidenced once again yesterday on the silver chart, with silver prices closing lower on the day, with the candle ending the trading session as a relatively wide spread down candle, but one which also gave us a bearish engulfing signal to add to the weakness already beginning to develop following the last few days of indecision. Although the low of the session appeared to find some support from the 9 day moving average, this has been swiftly overcome in early trading this morning with silver prices breaking below both the 9 and 14 day moving averages as a result. However, it must be remembered that yesterday was a national holiday in the US, and with the major markets closed trading throughout the day was on thin volumes with many markets seeing volatile price action as a result. 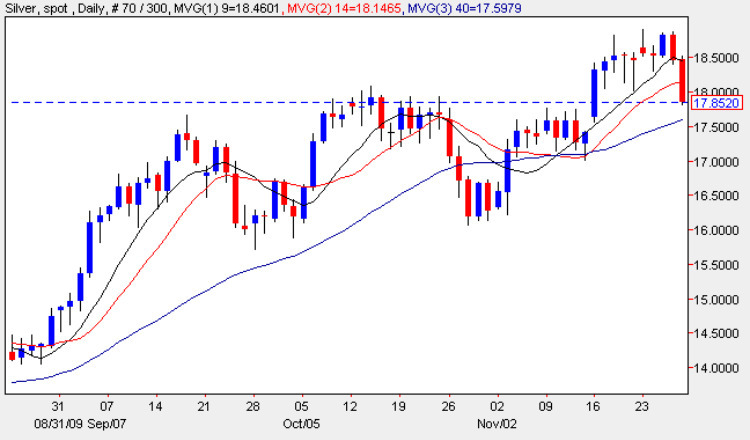 The key to the depth of any short term reversal will be the potential support offering by the consolidation region now waiting below, and in particualr the $17.50 to $17.70 price level – should this be breached then we could see a further period of sidewaysd price action once again for spot silver prices in the short term, but a hold and bounce at this level would indicate that a firm platform is now established with a consequent move back higher in due course. From a fundamental perspective the US Mint confirmred yesterday that sales of American Eagle’s silver coins have hit 26m ounces, the highest level in at least 23 years and although gold and silver coins account for a relatively small fraction of the precious metals market, analysts see them as a good proxy of retail investor appetite. The Mint also confirmed that it had exhausted its current stock of the one ounze Gold Eagle bullion coin.